Motherwell Football Club has today (Tuesday) parted company with manager Mark McGhee. The decision, taken by the Board following consultation with the ‘Well Society, comes after a disappointing run of results, culminating in Saturday’s loss at home to Dundee. Stephen Robinson, flanked by assistant James McFadden and Under 20s boss Stephen Craigan, has agreed to take temporary charge whilst a new permanent manager is recruited as swiftly as possible. The club wishes to thank Mark for his work during his second spell at Fir Park, particularly getting the club into the top-six during the 2015/16 season and wish him every success in the future. The best of the action from Excelsior Stadium where Ryan Bowman’s second half penalty was enough to give the Under 20s three points over Celtic. Striker Ryan Bowman said he feels “up to speed” after scoring the winning goal as Motherwell beat Celtic 1-0 in the Development League tonight. And MFC TV caught up with the Englishman, who bagged his first goal for McGhee’s side earlier this month. Bowman said: “I feel really good considering I haven’t played for a while. Fitness wise I felt up to speed and it’s always nice to get a goal. He added: “As a striker, obviously if you score goals it’s going to give you confidence and it was good for James McFadden the assistant manager and Stephen Robinson to be here. U20s boss Stephen Craigan hailed his sides work ethic as they beat Celtic under 20s 1-0 in the Development League tonight. A penalty from Ryan Bowman secured the points for the Steelmen, but Craigan admitted that the hard work of the team impressed him. Speaking to MFC TV at full time, the Northern Irishman said: “When you play against good sides you know it’s going to be tough work, they deal with the ball very well, they move the ball and they’re good in one-on-one situations. “Coming in to tonight’s game the message was ‘you’ll have to look after your own performance’. He added: “The intensity was better, we squeezed the game better, particularly in the first half. Motherwell under 20s returned to winning ways tonight with a hard fought performance against Celtic at the Excelsior Stadium. A Ryan Bowman penalty and a sturdy defensive showing secured all three points for the Steelmen, who moved to within two points of league leaders Hibernian. Stephen Craigan called upon senior players Ryan Bowman, Elliott Frear and David Ferguson as the under 20s looked to end a poor run of form. However, an in form Celtic side presented a tough task for the Steelmen, who narrowly lost the last time to two sides met earlier this month. Celtic were the side perhaps just on top for the opening 30 minutes, edging possession and having more efforts on goal than their claret and amber opponents, but it remained goalless. Michael Johnston and Theodore Archibald looked lively down either flank, with January signing Kouassi Eboue in the middle of the park for the Hoops. Oliver Pain didn’t have many saves to make, but was nearly undone by a powerful low strike from Johnston, which thundered back off the stoppers near post. He was then saved by full back Adam Livingstone, who cleared centre back Sam Wardrop’s goal bound header off the line following a corner. Motherwell had a couple of half chances, perhaps the best of those arriving at the feet of Shea Gordon, who couldn’t quite escape his marker to break through one on one and was eventually closed down by the onrushing Conor Hazard in the Celtic goal. The second half got off to a better start for the onlooking ‘Well fans when Elliott Frear collected the ball on the right flank, cut inside and danced past Calvin Miller only to be tripped in the process. Referee Calum Haswell pointed to the spot immediately. Bowman stepped up and made no mistake, lifting his penalty high and hard down the middle past the helpless Hazard to give the Steelmen the lead. Frear looked lively and ten minutes later picked the ball up centrally, skipped past his man and couldn’t get his shot away thanks to a cynical trip. The referee somehow didn’t give the freekick, but Bowman rushed in to collect the loose ball, turned neatly and struck a ferocious strike at goal but it was right at Hazard who could only palm it away. With a yellow card to his name and the likelihood of him picking up a second increasing, Hastie was replaced by Jordan Armstrong in the 70th minute. Celtic substitute Josh Kerr nearly levelled from four yards when he got on the end of a cross. But Pain managed to produce an outstanding reaction save to deny the visitors a levelling goal. Midfielder Conor McManus got on the end of a corner in the 82nd minute, but his glancing effort flashed across the face of goal and out for a goalkick. The Steelmen held on though and secured all three points thanks to a strong defensive performance and a Ryan Bowman penalty. Everyone knows somebody who has a birthday coming up soon, so why not celebrate at Fir Park with friends, family or even your Sunday football team? Party packages have already proved popular and our recent guests even got to meet some of the ‘Well players! Match tickets are included in all our box packages so contact us now to celebrate a special day and ask us how we can tailor your Birthday in a Box. 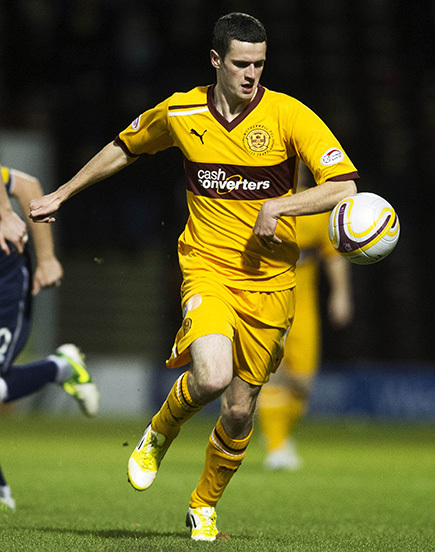 One of the more recent success stories to have come through the Motherwell youth set up is Jamie Murphy, now on the cusp of both top flight football in England with Brighton and Hove Albion and international football with Scotland. The former Knightswood Secondary School pupil was involved in Motherwell’s youth sides before he had even reached his teens and would go on to make the full journey to the Steelmen’s first team. Given his debut by Maurice Malpas in April 2006 as a substitute against Celtic at Parkhead, by quirk of fate Jamie’s final game in claret and amber was also against Celtic at that very same venue. In the intervening period Jamie would make more than 200 appearances for ‘Well, represent his country up to U21 level and become the club’s record European goalscorer. Murphy’s first Motherwell goal came in the final game of the 2007’08 campaign, a penalty against Hibernian at Easter Road and would be the first of many memorable strikes. A hat-trick against Albanians Flamurtari in the Europa League continues to live long in the memory with one of his finest goals reserved for the National Stadium where his surging run and shot helped Motherwell comfortably see off St Johnstone to reach the 2011 Scottish Cup Final. Equally adept at playing as an attacking left-winger or more centrally Jamie moved to Sheffield Utd for a reported £100,000 fee (with add ons) taking his leave on an emotional afternoon at Celtic Park in early January 2013. Taking a little time to settle in Yorkshire Jamie would spend two-and-half years in League One with the Blades, before making the progression to the Championship. Signed by Brighton in August 2015 he has become an integral part of a Seagulls outfit pushing hard for promotion to the English Premier League. With Gordon Strachan shortly to announce his first Scotland squads of 2017 it seems only a matter of time before Murphy,who was a non-playing member of the squad for the 2016 friendly matches against Denmark and the Czech Republic, will earn that elusive first cap for Scotland. Motherwell U20s face Celtic tomorrow night in the Development League as they look to bounce back to winning ways. The Steelmen lost 3-2 away to Dunfermline last week, meaning the youngsters have now lost three of their last four matches. It leaves Stephen Craigan’s side five points adrift of leaders Hibernian, and joint on points with Hamilton Accies and tomorrow’s opponents Celtic. Craigan may have a few senior players to pick from, including the in-form Jacob Blyth, who has three goals in his last three under 20s games. The game kicks off tomorrow at 6pm at the Excelsior Stadium in Airdrie. Highlights from Fir Park as Motherwell lose 1-5 to Dundee. ‘Well boss Mark McGhee took full responsibility as his side lost 5-1 against Dundee this afternoon. A disastrous first half left the Steelmen with a mountain to climb and McGhee feeling “disappointed and surprised” having prepared with his squad for such an important game. Speaking to MFC TV at full time, the manager expressed his feelings. He said: “We put out a back four that was a little bit improvised obviously with Tait, McManus and Hammell out, our most experienced defenders, which, in the end, cost us.